Fight To Win Pro 65 heads back to Dallas this Friday and sees a takeover from the organization's rising stars. Here are the three matches you NEED to see. Edmacon Moraes is a rising star representing Gracie Jiu-jitsu (Rillon Gracie). Moraes originally came up through the Cicero Costha ranks until moving to Arizona, where he received his black belt from Alex Faria. Still flying the Gracie Jiu-Jitsu flag, Moraes has made the jump to Texas, where he currently lives and trains. Like most 150lb athletes, Moraes only has one speed — fast — and will look to blow by Gerson Atoigue's guard in this match. Atoigue is a two-time F2W Pro veteran who holds wins over Jeff Curran and Gordon Kimura. He fights out of BJJ Roots and is an Arizona state champion wrestler. Atoigue has a versatile style and has found wins via decision in both of his appearances. Akbari is a multiple-time F2W Pro winner and has faced some of the best in the game, including Garry Tonon and Gianni Grippo. He also took the third place at No-Gi Pans back in October after narrowly losing to Jackson Sousa in the semifinal. A well-rounded competitor, Akbari loves to attack the legs and is a versatile wrestler on the feet. Sam Snow is primarily known for his gi tactics and is the owner of an incredible spider guard. We're curious to see exactly how his game transitions to no-gi. In any case, we're certain it will be explosive and showcase Snow's agility. Matheus Gabriel is the only person to compete for F2W belts in four different divisions: he is the current featherweight gi and no-gi champion, the former purple belt featherweight gi champion, and he will be competing for the lightweight brown belt title this weekend against Joseph Tonche. 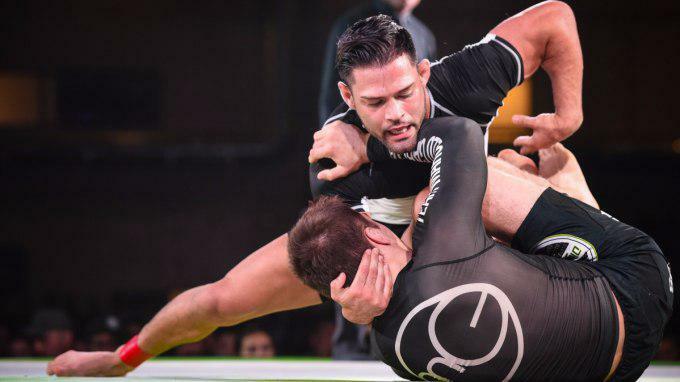 The Checkmat representative is equally skilled in and out of the gi and loves to pressure his opponents with strong passing and a generally brutal pace. Tonche is a three-time Fight To Win Pro veteran with two victories, including a nasty triangle finish over Robert Brice at F2W Pro 46.